Kainani Kahaunaele, center, was congratulated backstage by Rona Kekauoha, left, and Mihana Souza after Kahaunaele won the Most Promising Artist award during last night's Na Hoku Hanohano Awards held at the Hilton Hawaiian Village Coral Ballroom. Kahaunaele also received the Female Vocalist of the Year and Bill Murata Memorial Scholarship awards. Perennially popular kumu hula Keali'i Reichel was the big winner again last night at the Hawai'i Academy of Recording Arts' 27th annual Na Hoku Hanohano Awards. More than 1,100 Hawaiian music fans and members of the local music industry attended the Hilton Hawaiian Village Coral Ballroom ceremony as Reichel and his album "Ke'alaokamaile" won seven Hokus, including Album of the Year, Male Vocalist of the Year and Hawaiian Album of the Year. The wins included Reichel's fourth as Male Vocalist of the Year and made him a three-time winner for Album of the Year. Traditional Hawaiian music dominated many of the awards last night. "Hawaiian songs live," Reichel said just before he won Song of the Year. "I think it's a direct consequence of having such talented young people, not only composers but performers who understand what they are doing, who draw from a rich tradition and are able to bring it forward into this particular time." The winner of the Liner Notes Award was, from left, Keali'i Reichel, Puakea Nogelmeier and Fred Krauss. This was the first of many awards for Reichel and Nogelmeier as Reichel won a total of seven awards and Nogelmeier won two. Reichel and his longtime songwriting partner, Puakea Nogelmeier, took top honors in the Song of the Year category with "Ka Nohona Pili Kai." Reichel, Nogelmeier and several other members of the Punahele Productions ohana made a clean sweep of the technical awards with "Ke'alaokamaile" winning in the Liner Notes, Graphics and Engineering categories. Cecilio Rodriguez accepted Cecilio & Kapono's Contemporary Album of the Year award for their recording "Thirty Years of Friends -- Lifetime Party." Holding the two awards for himself and his longtime musical partner, he said: "I think Henry (Kapono) is still parking the car. So when he gets here, I'm going to tell him: 'I won two of these. I don't know where yours are.'" First-time recording artist Kainani Kahaunaele was another big winner. Her debut album, "Na'u 'Oe," won her Female Vocalist of the Year and Most Promising Artist honors. Kahaunaele also received the Hoku for Hawaiian Language Performance. Kaumakaiwa Lopaka Kanaka'ole won the Hoku for best first-time recorded Hawaiian-language song or chant with "Mele Ha'i Kupuna." 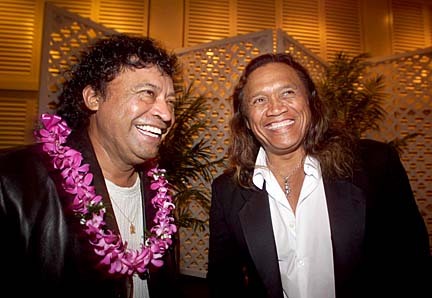 Cecilio Rodriguez, left, and Henry Kapono were backstage just after winning the Contemporary Album of the Year for "Thirty Years of Friends -- Lifetime Party." 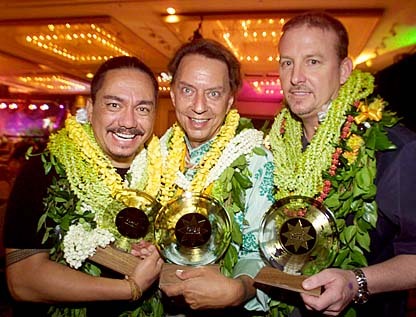 Maunalua took home a pair of Hokus as the trio's album, "Kuleana," led members to a Group of the Year victory, and music lovers named the group Favorite Entertainer of the Year in the only Hoku category in which the winner is determined by public vote. Overall, it was another year in which traditionalist Hawaiian music prevailed over all other styles of music. Reichel, Kahaunaele and Maunalua are all traditionalists who perform primarily in Hawaiian. Jawaiian, reggae, jazz, hapa-haole, pop and rock artists won only in individual genre categories. Local record industry legend Jack de Mello, 87, won in the Anthology category as the producer of "Nina," a collection of recordings by Nina Keali'iwahamana, and may be the oldest person to have received a Hoku in any category other than Lifetime Achievement. Hawaii-born Jack Johnson won in the Rock Album category for his nationally released hit album, "On and On." "Everywhere else they say my music is a little too mellow, and in Hawaii I win rock album of the year," he said. Haku Mele: "Mele Ha'i Kupuna," Kaumakaiwa Lopaka Kanaka'ole, "Ha'i Kupuna"
Engineering: Jim Linkner for "Ke'alaokamaile"
Liner notes: Fred Krauss, Puakea Nogelmeier and Keali'i Reichel for "Ke'alaokamaile"
Bill Murata Memorial Scholarships: Donna Kainani Kahaunaele, graduate of Hawaiian language and literature at University of Hawaii at Hilo, and Cherissa Henohea Kane, a Hawaiian Studies student at University of Hawaii at Manoa.